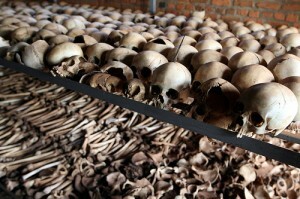 The Rwandan genocide in 1994 probably marks the most devastating event in the history of the Great Lakes Region. 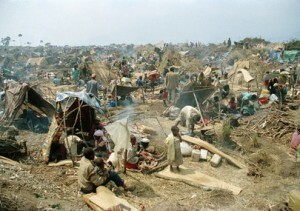 The violence in Rwanda caused one of the largest refugee floods in history moving to neighboring countries. Particularly the DRC’s Kivu regions faced large masses of refugees settling in several camps. This third episode of eufrika’s KIVU-SERIES concentrates especially on that phase during the genocide and its immediate aftermath. For an understanding of the outbreak of the genocide and the region’s struggle for peace, the years before the genocide in Rwanda need to taken into account. In 1988 the Rwandan Patriotic Front (RPF) was formed by Tutsi exiles in Uganda that launched an invasion in 1990. In the course of that invasion, the confrontation between Bahutu and Batutsi was getting more intense again. What followed were violent clashes between Bahutu and Batutsi. In 1993, peace efforts led to the Arusha Accord which was seen as a success in the ongoing tensions. But the mysterious death of Rwanda’s president Habyarimana in April 1994 gave Hutu extremist political leaders and the militias of the Interahamwe reasons to blame the Tutsi minority for the death of their president. Within the following 100 days almost 800.000 Batutsi and moderate Bahutu were killed. This event marks the most devastating moment in the history of the Great Lakes Region. It was the beginning for more than ten following years of warfare. But it was not only the event with the largest number of victims in such a short period of time but it also posed other difficulties in a region that was already shaken by warfare to such a high extent. The biggest difficulty the international community and the region’s states were facing in the aftermath of the genocide was the large floods of refugees and resulting violence. According to reports from the UNHCR the DRC was facing an influx of refugees of more than 1.2 million only from Rwanda within a few days. The refugees caused high social tensions in the specific areas where they found shelter. This was mainly favored by some region and country specific circumstances. First of all approximately 60.000 génocidaires were hiding within the refugee masses. Secondly Zaire’s central government unter Mobutu Sese Seko supported the Habyarimana regime in Rwanda and also kept on backing the FAR and its top-level officers and politicians. Already before the outbreak of violence in 1994 Mobutu backed the former Rwandan army under Habyarimana with his elite troops supported by France. The results of the mix of old and new tensions between the several groups in the region were new alliances. While the Rwandan Bahutu forces fought against the Batutsi Banyarwanda with the support of local groups, these Batutsi were supported by the RPF in Rwanda. The Rwandan Hutu forces were extremely devastating for the region. After the Ugandan backed RPF under the command of Paul Kagame ended the killing in Rwanda, most of the génocidaires fled to the neighboring present day DRC. They took shelter in the bush of North Kivu province and the newly installed refugee camps of the United Nations. Within weeks the camps became more and more militarized and the Interahamwe, Impuzamugambi and Hutu extremists (ex-FAR – Forces Armées Rwandaises) systematically controlled the camps. They used the international aid for rebuilding a military apparatus with the aim to recapture Rwanda from the RPF. They systematically terrorized the refugees and borderland villagers, recruited fighters and launched attacks on Rwanda that was only a stone’s throw away. This process of militarization and the attacks on bordering Rwandan territories led into the RPA invasion in former Zaire in 1996. The new Rwandan government accused the Zairian government of backing former génocidaires who committed the genocide in Rwanda. Moreover the highly militarized camps were seen as a daily threat for Rwandans who were still suffering from daily violence. This group of former Rwandan rebels the FDLR is still operating in the dense forests of the North Kivu region nowadays. Probably this is one reason of the Rwandan government always keeping an eye on the happenings in North Kivu. In the upcoming fourth episode of the KIVU-SERIES, eufrika will highlight briefly other threats the large masses of displaced people meant for Kivu villagers. Particulalry because of the recent situation around Goma, past situations afterthe genocide in Rwanda seem to repeat themselves, which can be compared with the situation nowadays.